The Water Key is a true advocate for the entire Wellness Filter® product line. The Wellness® Filter was developed over 20 years ago in Japan by Haru Naito, a famous physiologist who coupled purification and Magnetic Resonance Activation enhancement technologies into this award winning water filter. Wellness Enterprises is listed and certified by NSF International. Because of its ability to purify as well as enhance water, Japanese life insurance companies have recognized the Wellness Filter® for its unique qualities and they now offer reimbursement programs for the filter when a patient gets a prescription from his doctor (the only filtration system ever granted this insurance status). Although new to America, several well known US institutions have already tested and now endorse the Wellness Filter®. The Hippocrates Health Institute, the number-one rated medical spa in the world, has moved away from its 20-year tradition of using only distilled water and now exclusively uses Wellness Filter® water and recommends it to their patients. The Wellness Home MG-III comprises a filtration and enhancement system that delivers the purest and most natural tasting water available. It effectively reduces harmful contaminants, while at the same time enhancing the water with delicate ions and minerals. You’ll notice the difference in your skin and hair after just one bath or shower. It’s like bringing a spa into your home. The Wellness Kitchen S-III comprises a filtration and enhancement system that delivers the purest and most natural tasting water available. It effectively reduces harmful contaminants, while at the same time enhancing the water with delicate ions and minerals. You will also love the effect Wellness water has in your kitchen with the enhanced flavor it brings to your gourmet cooking. Some of the world’s great restaurants use Wellness filter systems. The Wellness Kitchen S-III has the option of an under-sink installation. You can easily convert your counter top Kitchen S-III to an under-sink model. The kit contains everything you need, including a faucet, mounting hardware, shut-off valve, cold water plumbing connector, black tubing, a leak sensor and four AA batteries. The only visible part of your new S-III system will be the beautiful stainless steel faucet that is designed to fit into the standard accessory hole of your kitchen sink. The Wellness Shower effectively reduces up to 99% of Chlorine for up to 24 months - two or three times longer than any other shower filtration system available. Many don't realize that the hot water from our showers opens up the pores of our skin and we end up absorbing over 600% more chlorine and other chemicals than we would from drinking the same un-filtered water all day. Using Wellness Shower™ eliminates this concern while promoting a healthier, sanitized shower. The Wellness Carafe is designed to give you a "taste" of Wellness, introducing you to the benefits of their Purified and Enhanced Water at an attractive price. 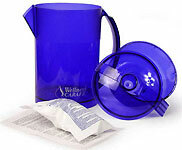 If you want clean, safe and refreshing water in a pitcher design, then the Wellness Carafe is ideal for you. Like all Wellness Filter products, the Carafe’s multi-stage cartridge contains their famous enhancement media for improved hydration, soluble minerals and reduced ions. The Wellness Wand is your portable partner protecting you from the harmful effects of chlorine and improving the taste of the water you drink. Just swirl the Wellness Wand in your glass for 15 seconds. It reduces harmful free radicals like chlorine and chloramines and gives you enhanced, healthier water with the further benefit of negative ions.